SHIELDEX® metalized conductive fabric provides vast flexibility for many different applications. These fabrics are plated throughout with 99% pure silver. The SHIELDEX® Silverell® line of fabrics are a combination of 99% pure silver nylon yarns and non-conductive yarns. Additional coatings such as copper, nickel, and tin can be applied depending on the field of use. The applications for plated fabrics are endless, some examples include RF & EMI Shielding Faraday Enclosures & Tents, RF, EMI, & RFID Shielding Curtains, RF & EMI Shielding Faraday Pouches & Bags, RF & EMI Shielding Garments & Clothing, and Smart Textiles to name a few. 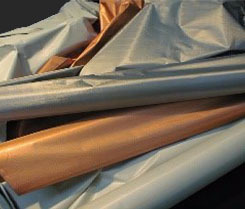 We also offer metalized conductive polyester fabric which are listed below as our LX fabrics. Non-woven conductive fabric is made from long fibers and bonded together. Metals used are Silver (Ag), Copper (Cu), Nickel (Ni) and Tin (Sn) in various combinations. Additional available coatings provide solutions for corrosion protection, enhanced EMI shielding effectiveness, and/or environmental concerns. Adhesives can be added upon request. Some applications include RF shielding wall paper, cable shielding, gaskets, filtration media, heating elements, conductive tape and passive static eliminator. Woven Conductive Fabric is formed by weaving. These are available in both a basic plain weave (PW) which is strong and durable, and a rip stop weave (RS) that is reinforced to resist tearing. Metals used are Silver (Ag), Copper (Cu), Nickel (Ni) and Tin (Sn) in various combinations. Some applications include but are not limited to EMI/RFI gasket and garments, RF shielding for enclosures, curtains, pouches, I/O panels, clean room compatibility (CR), Etchtex program, passive static eliminators, antimicrobial purposes, thermal applications and IR reductions. Medical fabric is offered in various weights and textures including both knits, and elastic knits with single (SD) or double direction DS) stretch as well as some woven forms. These fabrics are usually silver plated only, with 99% silver (Ag). Medical fabric is available with an anti-tarnish coating (+B). Silver is a natural antimicrobial treatment that limits the infections from bacteria for human and veterinarian purposes. Applications for our medical fabrics include; island wound dressings, compression wraps, garments and other products made for antimicrobial, allergen, anti-odor, fungicidal, atopic skin disorders, and thermal conductivity. Although most of the medical fabrics are used for silver ionic release there are some that can be used for EMI/RFI applications and theatrical drapery. Technical fabric is our conductive silver knitted fabric with elastic that come in a single direction (SD) or double direction (DS) stretch. While these fabrics can be used in the same applications as our medical fabrics, Technical fabric is generally used for applications that require a higher conductivity like smart wear. Applications include; sensors (vital signs, stimulation of nerves and muscles, etc. ), EMI shielding, and reflection to name a few. RTF Fabric (Ready to Fabricate) includes some of our woven or non-woven metalized fabrics containing additional coatings including; carbon (C2), hot melt adhesives (HMA), pressure sensitive adhesives (PSA) or low density thermoplastics (LDPE). These fabrics are typically used in similar applications as are woven fabrics, as well as wallpaper, tapes, medical electrodes and fingertips for touch screen gloves. Mesh fabric is knitted mesh which are plated with silver (Ag), additional metals can be added for your custom application. Mesh Fabric applications include but are not limited to, RF shielding for windows, medical garments, composite, antimicrobial purposes, resistance heating, and automotive or aerospace applications where a light weight mesh is needed. Wearable fabric is a combination of our silver plated yarn which is knitted or woven with various non-conductive yarns. Our Silverell® line of fabrics are used for anti-microbial, fungicidal, and thermal applications such as garments and other related products. Some of our Silverell® fabrics have the ability to provide personal RF shielding. Our stainless steel fabric (SS) and ESD woven fabrics are used for ESD garments and curtain applications.